"There are a hundred different ways to cook chicken curry, but Bengalis (from the eastern part of India) make something called Kosha (or kawshaa) which is very good with either rice or any kind of flat bread. 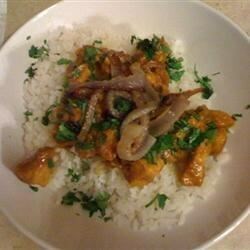 This recipe is called moorgi kosha (or chicken kosha), but my friend Jennie calls it Chicken Chicken Curry!" Heat the olive oil in a skillet over high heat. Stir in 1/3 of the onion; cook and stir until the onion is golden brown and crisp, about 5 minutes. Season with salt. Remove the onion from the oil and drain on a paper towel-lined plate. Set aside. Place the remaining 2/3 of onion and the bay leaf into the same skillet over high heat. Cook and stir until the onion has turned golden brown, about 5 minutes. Stir in 1 tablespoon of water, then add the turmeric, chili powder, paprika, ginger, and garlic. Reduce heat to medium-high and continue to cook and stir until the liquid has reduced, then stir in another tablespoon of water. Place the chicken and tomato slices into the onion mixture. Season with salt and sugar. Stir in the cardamom pods, cloves, cinnamon stick, ghee, and 1 tablespoon of water. Cover and simmer on low until the liquid has reduced, 30 to 35 minutes. Stir in the coriander. Simmer until the liquid has evaporated. Sprinkle with cilantro and reserved fried onions before serving. Great, I add 1 cup of water and yogurt at the very end and turned out great. Thanks for the recipe. Family loved it. Husband went for seconds. added carrots and some ground spices instead of the whole when I didnt have it.. my kids 1 and 3 devoured it! !